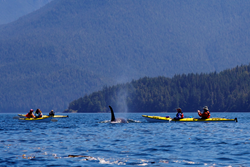 Vancouver Island adventure travel company gets visitors to unplug and unwind this summer as they kayak with Orcas in their natural environment. You get to see these marine animals in their habitat where they were always meant to be. There are no feeding times, and no fences here. At a time when fewer Killer whales are being held in captivity for public display in aquariums, an adventure travel company on Vancouver Island, BC is giving tourists an opportunity this summer to witness these magnificent creatures in their natural, wild habitat. Based in Port McNeill, Ecosummer Expeditions offers visitors a chance to kayak with Orcas and other marine mammals in a serene coastal environment on the northern end of Vancouver Island. There have been a number of reports in March indicating major aquariums are discontinuing their Orca breeding programs and theatrical shows. Kim Cameron, marketing manager with Ecosummer, says Orca Camp has become a timely alternative for adventure-minded families who still want to connect with nature during their summer holidays. Cameron notes there is also no Wi-Fi available at their wilderness base camp on Warden Beach, which is a rare treat for those with the right mind-set. Once guests board the one-hour water taxi from Port McNeill, “you're unplugged for the duration of your trip,” she notes. Ecosummer Expeditions offers three-to-six-day guided Orca Camp kayaking tours of Johnstone Strait, for groups of up to 10 people at a time. Their base camp sits adjacent to the Robson Bight Ecological Reserve, the only protected Killer whale habitat in the world, making it the best place in British Columbia to see Orcas in the wild. Cameron says the paddling itinerary is dictated by weather, whales and the ability of the group—which often ranges from inexperienced paddlers who have never sat in a kayak before to those who enjoy paddling on a regular basis. She adds guests must be eight years or older to go kayaking with Orcas. Anytime between July and September is ideal to head out with Ecosummer Expeditions, as this is when the Northern Resident Orcas traditionally ply these territorial waters. With the salmon running through the Strait during their annual spawning migration, it provides an irresistible meal for hungry Killer whales. It’s possible to spot other marine animals, including Humpback whales, Pacific White-sided dolphins, sea lions and porpoises. Regulations are in place to ensure the Orcas aren’t hassled by adventure tourism operators, both in kayaks or motorized vessels. “If the fins are up, our paddles are down,” explains Cameron, adding guests are required to keep a distance of 100 metres/yards when kayaking near any marine mammal. Ecosummer Expeditions offers a number of other Vancouver Island adventure travel excursions, including: wilderness adventures, West Coast Trail hikes and wildlife safaris. Since 1976, Ecosummer Expeditions has been providing Vancouver Island adventure travel opportunities in a picturesque coastal setting. Situated on 400 metres of private beachfront, and on the edge of a temperate coastal rainforest, Ecosummer’s base camp is the ideal place for adventure seekers to begin their journey. Led by expert guides, our marine and wilderness tourism programs are designed to inspire and educate guests, while enhancing their appreciation of this rare ecosystem on northern Vancouver Island.